We all know, “You get what you pay for”. It’s a cliché, rule of thumb that we can loosely apply to many things in life. Of course, it doesn’t always work that way. 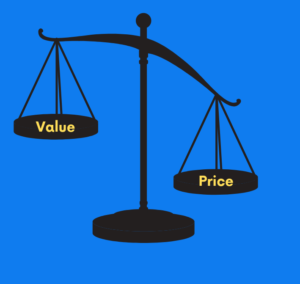 You can pay a lot for something and not get value out of it. That said, the Rule does generally work better on the other side of that equation: it is very rare to pay a little and get a lot. You can pay a premium price for a car and get a lemon. It is very difficult to invest a minimal amount in a car and get a premium, reliable vehicle. These same economic rules apply to IT Support. There is no assurance that paying a lot of money will get you a great IT environment. However, it is almost certain you’ll get IT Mediocrity if you invest minimally in this part of your business. Smart Dolphins is a comprehensive Technology Success Partner (TSP). We care too much about our Allies to not charge enough. This has resulted in some seeing us as “expensive” or as a “luxury”. “We need a Honda, not a Ferrari”. For our clients, who rely heavily on their IT, we are their “cheapest” option. For the busy insurance company, law firm or non-profit with 30 users all using technology strategically, we leverage their IT investment incredibly well compared to a more basic service. We lower their problems and risks, help them budget and be strategic. We create a progressive IT environment. All this pays back so much more than the additional investment made to get these results. I can also honestly say there are a few times through our various learning experiences as a company where we struggled to pay a return on an clients’ investment. We’ve also taken on a few customers that had previously spent a ton and got very little. You can’t just throw money at problems. More importantly, I can say with certainty that we could not lead our Allies out of IT Mediocrity without asking them to invest in what it takes to get them there. Smart Dolphins isn’t the right IT provider for every organization; not every company can or needs to prioritize their IT. But what I will say is that nobody that invests “way less” gets the same results as “Technology with Porpoise”.